We present the case of a 35-year-old female who presented with abdominal pain and irregular menstrual bleeding. The patient was found to have a left adnexal lesion on ultrasonography and contrast-enhanced computed tomography. Based on the preoperative imaging and biochemical workup, a left ovarian cystectomy was done. 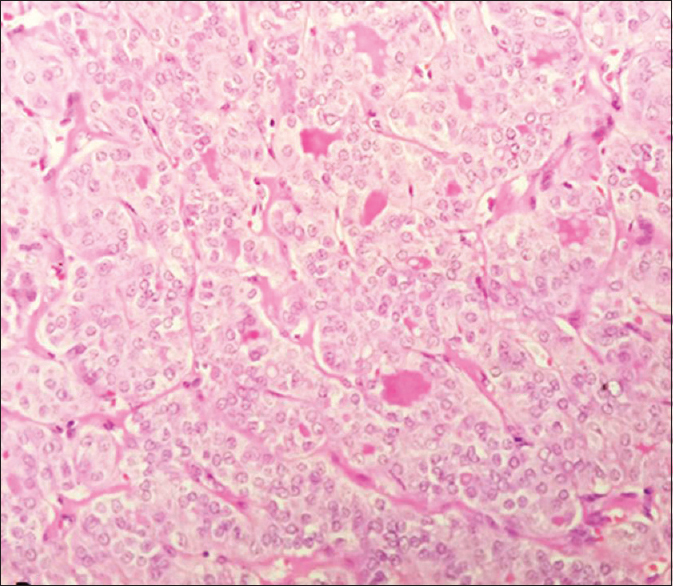 Histopathology (HPE) revealed follicular variant of papillary carcinoma thyroid in a background of struma ovarii. The patient then underwent total thyroidectomy. HPE showed no malignancy in the thyroid gland. After achieving the desired level of thyroid-stimulating hormone, postoperatively, the patient underwent a diagnostic I-131 whole-body scan (WBS) which revealed remnant thyroid tissue in the neck only. The patient's remnant thyroid tissue was ablated with I-131. Follow-up at 6-month interval revealed normal ultrasound pelvis, no abnormal uptake in diagnostic I-131 WBS and serum thyroglobulin (Tg), and anti-Tg antibody levels within normal range. Struma ovarii is a rare condition. It represents 0.5%–1% of all ovarian tumors and 2%–5% of all ovarian teratomas. Ectopic thyroid tissue can be seen in ovarian dermoid tumors, but struma ovarii represents mature ovarian teratoma with at least 50% or more as thyroid tissue. Malignant form of struma ovarii is even rarer, with the occurrence in 0.3% to 5% of these struma ovarii tumors. Patients usually present with pain in abdomen, menstrual problems, and palpable abdominal mass and less commonly show overt signs and symptoms of hyperthyroidism. Thyrotoxicosis can be seen in 5%–10% of struma ovarii cases. We will be discussing the management of one such patient of malignant struma ovarii and follow-up strategy applied in this case. We are presenting the case of a 35-year-old female who presented with a history of pain in the abdomen for 6–7 months. It was associated with irregular menstrual bleeding for 2 months. On evaluation with ultrasonography (USG), a left ovarian cyst measuring 6.3 cm × 4.6 cm with mixed echotexture was noted. Abdominal contrast-enhanced computed tomography [Figure 1]a,[Figure 1]b,[Figure 1]c was done which revealed a lobulated left adnexal lesion, measuring 4.3 cm × 3.1 cm × 3.8 cm with moderate enhancement in peripheral solid component and central nonenhancing component within the lesion. The ovarian tumor markers, serum carcinoembryonic antigen of 0.99 ng/mL (laboratory normal <3.0 ng/mL), cancer antigen 125 of 15.0 U/mL (laboratory normal <35.00 U/mL), and beta human chorionic gonadotropin of <1.20 mIU/mL (laboratory normal <5.0 mIU/mL) were in normal limits. There were no signs and symptoms suggestive of hyperthyroid state, and the thyroid profile was in euthyroid range (serum thyroid-stimulating hormone [TSH] – 2.4 mU/L). Laparoscopy was planned and per laparoscopy findings suggested normal-appearing uterus, right ovary, and bilateral Fallopian tube More Detailss with a left ovarian cyst of around 5 cm × 5 cm with yellowish material oozing from cyst. Left ovarian cystectomy was done at this time and the patient was then referred to our center. Histopathology (HPE) [Figure 2] revealed tumor specimen entirely composed of thyroid tissue, with mature thyroid tissue displaying varying sized colloid-filled follicles and also a large area displaying papillary and follicular architecture, with cells displaying overlapping nuclei, nuclear grooves and inclusions, and scattered mitotic figures suggesting follicular variant of papillary carcinoma thyroid in a background of struma ovarii. The patient did not comply for further pelvic surgery. Later, the patient underwent total thyroidectomy and HPE showed no evidence of malignancy in the thyroid gland. 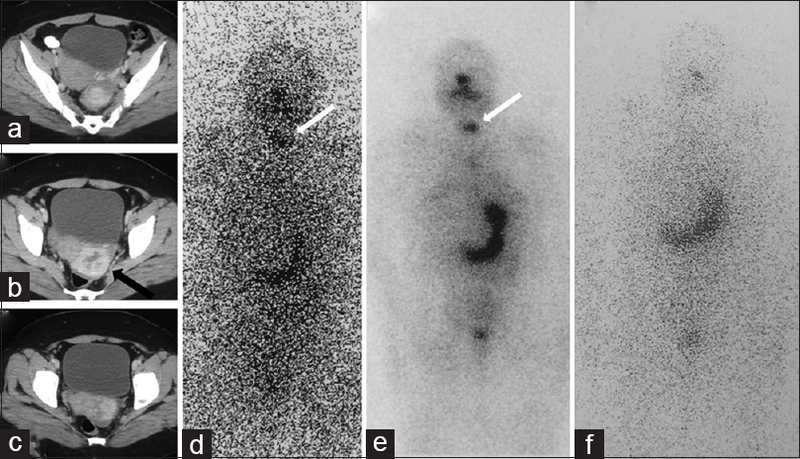 Four weeks posttotal thyroidectomy, the patient underwent a diagnostic 2 mCi I-131 whole-body scan (WBS) after achieving an adequate elevated serum TSH level (128 uIU/ml). WBS [Figure 1]d revealed radioiodine uptake in remnant thyroid bed with uptake value of 0.4% and no evidence of any metastatic disease. The patient's stimulated serum thyroglobulin (Tg) level was 3 ng/ml, and serum anti-Tg antibody (ATA) level was 24 mIU/L (normal range: 0–125 IU/mL) at this time. The remnant thyroid tissue was ablated with 30 mCi I-131 dose. A 24-h posttherapy scan [Figure 1]e revealed no additional lesions in the neck or any residual abnormal lesions in the pelvis. Follow-up at 6-month interval reveals no abnormality in ultrasound pelvis, no abnormal uptake in diagnostic I-131 WBS [Figure 1]f, and stimulated serum Tg levels of 5 ng/ml. Now, she is kept on regular follow-up on suppressive dose of thyroxine. Struma ovarii is a type of mature ovarian teratomas having ectopic thyroid tissue. These patients usually are asymptomatic and many a time detected as ovarian cyst on routine USG checkup. When symptomatic, these usually have nonspecific symptoms common to ovarian pathologies, including pain in abdomen, palpable lump, and irregular menstrual bleeding. Benign struma ovarii with functioning thyroid tissue can be an uncommon cause of thyrotoxicosis. In our patient, no clinical features suggestive of hyperthyroid state were present and thyroid profile before the surgery was in euthyroid range. Malignant change can be seen in this ectopic thyroid tissue associated with struma ovarii. Both papillary and follicular carcinomas have been reported in relation to malignant struma ovarii, with follicular type seen more commonly. Furthermore, coexistent primary thyroid cancer can be seen along with struma, as mentioned in up to 9% cases in one large series. Management of benign struma ovarii is surgical resection in the form of cystectomy or unilateral salpingo-oophorectomy; however, data regarding optimal management and follow-up of malignant struma ovarii are still lacking. Even recent guidelines for management of thyroid nodules and differentiated thyroid cancer that we studied does not mention about the management of malignant struma ovarii with evidence of thyroid cancers in them. Adjuvant treatment for malignant struma ovarii in the form of radioiodine therapy has been suggested by few studies, including one study by DeSimone et al., in which they have shown an improved outcome in patients who underwent total thyroidectomy and I-131 ablation compared to the group managed conservatively. Surgical resection of the primary ovarian mass is the first step in the treatment of struma ovarii. Regarding the extent of surgery for the primary ovarian mass, no standard guidelines exist in relation to those with struma ovarii. Surgical intervention varies from total abdominal hysterectomy with bilateral salpingo-oophorectomy with or without omentectomy as done for malignant epithelial ovarian tumors, which results in loss of fertility, to unilateral salpingo-oophorectomy/oophorectomy or cystectomy for preserving the fertility. However, cystectomy alone in managing these cases is suggested to be suboptimal, though there is no strong evidence in literature regarding the prognosis of these patients managed with cystectomy alone. To facilitate radioactive I-131 uptake and treatment of residual and metastatic disease, removal of thyroid gland is necessary before I-131 therapy can be planned. Total thyroidectomy also allows monitoring with serum Tg levels postoperatively, where increased Tg levels in a patient on suppressive levels of TSH indicate persistent or recurrent disease. Regarding prognosis of patients with malignant struma ovarii, being a rare pathology, exact information about long-term prognosis is unclear; however, a few smaller studies have demonstrated good prognosis, including one study by Robboy et al., in which they have reported 5-, 10-, and 25-year survival rates of 92%, 85%, and 79%, respectively. Our patient is asymptomatic on thyroxine, with USG pelvis, I-131 WBS, and Tg/ATA levels within normal limits as of date. Yoo SC, Chang KH, Lyu MO, Chang SJ, Ryu HS, Kim HS, et al. Clinical characteristics of struma ovarii. J Gynecol Oncol 2008;19:135-8. Outwater EK, Siegelman ES, Hunt JL. Ovarian teratomas: Tumor types and imaging characteristics. Radiographics 2001;21:475-90. Gould SF, Lopez RL, Speers WC. Malignant struma ovarii. A case report and literature review. J Reprod Med 1983;28:415-9. Ross DS. Syndromes of thyrotoxicosis with low radioactive iodine uptake. Endocrinol Metab Clin North Am 1998;27:169-85. DeSimone CP, Lele SM, Modesitt SC. Malignant struma ovarii: A case report and analysis of cases reported in the literature with focus on survival and I131 therapy. Gynecol Oncol 2003;89:543-8. Goffredo P, Sawka AM, Pura J, Adam MA, Roman SA, Sosa JA, et al. Malignant struma ovarii: A population-level analysis of a large series of 68 patients. Thyroid 2015;25:211-5. Haugen BR. 2015 American Thyroid Association Management Guidelines for Adult Patients with Thyroid Nodules and Differentiated Thyroid Cancer: What is new and what has changed? Cancer 2017;123:372-81. Al Hassan MS, Saafan T, El Ansari W, Al Ansari AA, Zirie MA, Farghaly H, et al. The largest reported papillary thyroid carcinoma arising in struma ovarii and metastasis to opposite ovary: Case report and review of literature. Thyroid Res 2018;11:10. Luo JR, Xie CB, Li ZH. Treatment for malignant struma ovarii in the eyes of thyroid surgeons: A case report and study of Chinese cases reported in the literature. Medicine (Baltimore) 2014;93:e147. Rose PG, Arafah B, Abdul-Karim FW. Malignant struma ovarii: Recurrence and response to treatment monitored by thyroglobulin levels. Gynecol Oncol 1998;70:425-7. Robboy SJ, Krigman HR, Donohue J, Scully RE. Prognostic indices in malignant struma ovarii: Clinicopathologic analysis of 36 patients with 20+ year follow-up. Mod Pathol 1995;8:95.